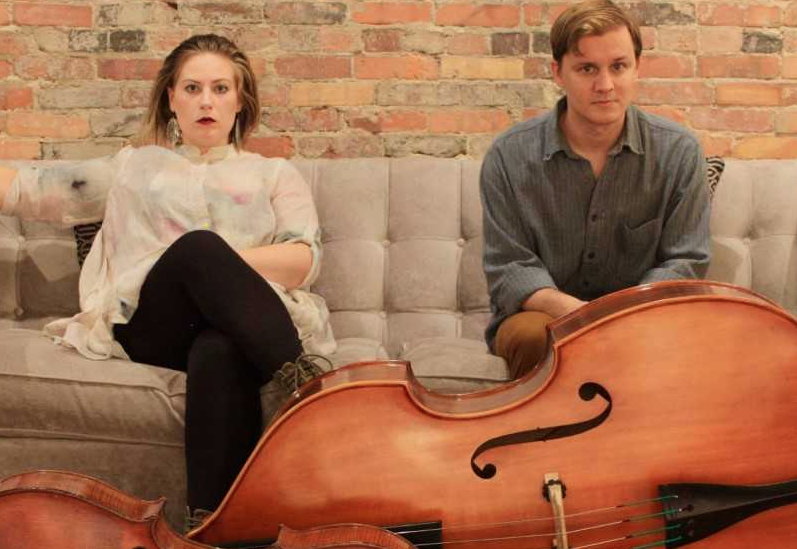 Gorski plays the upright bass and sings and Miller plays cello in a duo they call Okapi. Their music draws from classical, jazz, Middle Eastern and psychedelia phrasings, and through his lyrics, Gorski tries giving artistic voice to a doctrine and philosophy written like a mission statement on the Okapi website. “Okapi is this representation of that tabula rasa, starting fresh, and expressing this struggle of trying to become a conscious individual,” Gorski said. Gorski came up in music playing electric bass in a variety of indie rock bands around Chicago. He wanted to step away from that when he placed an ad in Craigslist in search of a sax player and drummer. Miller was a classically trained cellist who felt bored and trapped along the orchestral performance track before answering Gorski’s ad. That was six years ago, and they felt an immediate artistic kismet. Okapi started as a trio, with a drummer behind Gorski and Miller, but people in Chicago didn’t know how to define, let alone appreciate their music. Gorski used his tax refund three years ago to buy an upright bass and pay for a move with Miller to New York City. By then, they were a couple both musically and romantically. “We get along really well and I have a hard time imagining anyone else really understanding me on such a level,” Miller said. While they found warm welcomes at venues and house shows, the cost of living and to their spirits drove them out after a year. Gorski and Miller had passed through this area on a road trip, drew up a pro/con list of moving and planted their flag in West Asheville. That record is called “Carousel Part 1,” and it’s a concept album, of sorts. They’re already deep into the writing of “Carousel Part 2.” Okapi are launching “Carousel Part 1” with a Nov. 1 performance at Revolve in Asheville. Only those involved with local theater might be surprised Steven Samuels is back in action. In September of last year, Samuels was fired from Asheville’s Magnetic Theatre, which Samuels co-founded and ran for eight seasons. He was still smarting, still angry, when he decided, in some respects, to pick up right where he left off, but with a fresh company. Imagine you’re in a band performing at a club or even if you’re just a solo artist with a guitar in a coffeeshop. You want to sense people are listening. You want engagement. You want applause. That is, unless you’re one of the members of the longtime Asheville trio Free Planet Radio. They recall a recent show at the Light Center in Black Mountain that was one continuous flow of music for nearly 90 minutes.